Tweet these when you reach the appropriate part in the game and Gilgabot will let you know your next job. Pre-registration players can find their Wind job on the Players Page or their personal page. After pre-registration players will receive their Wind job upon registering. Note: Two Fire Jobs (Ranger and Bard) are not available as soon as you get Fire Crystal Jobs. Keep playing and you’ll get them. Each victory tweet needs to be a separate tweet. Do not send them all in one tweet. #Victory: Tweet this after beating Exdeath. #VictoryShinryu: Tweet this after beating Shinryu. #VictoryOmega: Tweet this after beating Omega. #MyJobs: Have Gilgabot notify you of your currently unlocked jobs. IMPORTANT: #Up cannot be used with any other tag. If you do #Fire and #Up together you will just get your #Fire job and nothing will be logged! #Pledge: Make a donation pledge that will be listed here! Players will be assigned one class from each crystal. Until all four classes are unlocked, players are only permitted to use the classes they have currently unlocked. Bare/Suppin/Freelance can only be used until the Wind Crystal job is unlocked. Players will be assigned one class from any of the available jobs when new jobs are unlocked. As above, Bare/Suppin/Freelance can only be used until the Wind Jobs are obtained. Players will be assigned jobs. A Regular Run, Random Run or Chaos Run can have the modifiers 750 or No 750 appended to them. Players will be be assigned jobs that can break rods or jobs that are similar in play style and theme. Players will only be assigned jobs that cannot break rods and follow within that play style and theme. The following are special run types with their own job restrictions already in place. Modifiers such as 750 and No 750 cannot be applied to these runs. Players will be assigned jobs totally randomly. Freelancer and Mime and included. Players will be assigned jobs weighted towards the more popular jobs as voted during the Spring Voting Session! This assigns jobs like Chaos but you are more likely to get popular jobs. So if you get a lot of unpopular jobs, congratulations! You were unlucky. Players will be assigned jobs in a manner similar to a regular run, but with slightly different odds. In addition, you must tweet #Void before entering the giant black hole in World 3 before you finish the game. The following spoils some of what happens but should be checked for clarity: #Void will take away one of your jobs. You can no longer use that job or its abilities on any of your characters. 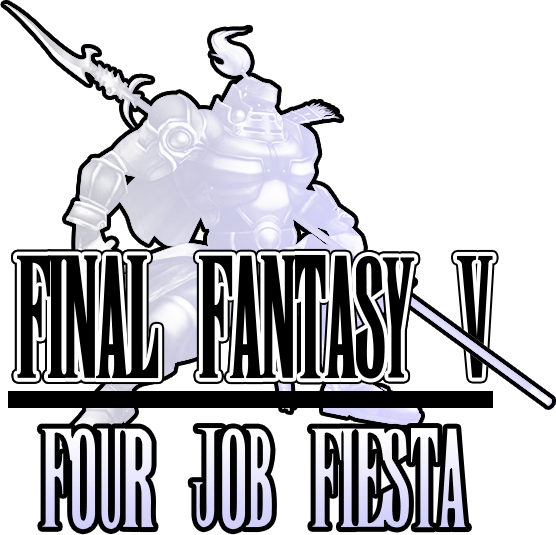 Your fourth job will be one of the extra jobs introduced in the GBA version of FF5, so SNES and PS1 players please note that you either play with one less job or use a newer version of the game for this run. You may add one of the following to your run. Of course none is also an option. Natural can be added to any run. To do so either tweet #natural to Gilgabot after registering or include it in your registration tweet. What this means it that you intend on playing with these extra rules in mind. Bartz must use the Wind crystal job exclusively. Lenna the Water, Faris the Fire and Galuf/Krile the Earth. If you are playing a mode other than Normal you simply assign the job listed in that slot on the players page for your job. Characters must remain Freelancer until their job is unlocked. Team No 750 players must not break rods. Characters may not use skills from other jobs. This means no giving Black Magic to Bards and the like. Only skills learned naturally from the one assigned job may be used. Upgrade can be added to any non Natural-run. To do so either tweet #upgrade to Gilgabot after registering or include it in your registration tweet. What this means it that you intend on playing with these extra rules in mind. You will only use your Wind Job until you unlock your Water Job. Water until you unlock Fire, and then Fire until you unlock Earth. Then once you unlock your Earth job will be the job you use until the end of the game. Any abilities learned from the previous jobs may be used. Of course, we here at the Fiesta do not want to force upgrades on our users. So you may tweet for your next crystal job when you are ready to #upgrade! Krile is her own character, so why does she not get her own job? With Fifth Job, Galuf's job (your Earth Crystal job) will be overwritten by a new job. You lose access to the old Earth job and its abilities. You will get another job depending on your run type. You'll tweet "#krile" to unlock the fifth job just like you'd tweet #water, #fire and #earth to get those jobs." BERSERKER RISK can be added to any run (Excluding Classic Jobs) to give the player a chance of getting the Berseker job assigned to their Water, Fire or Earth Crystal slots. The only difference is that a Normal run will have their Water Job set to Berserker instead of any other slot. To do so either tweet #BERSERKERRISK to Gilgabot after registering or include it in your registration tweet. When the Fiesta starts, for every $X of donations (to be decided based on the registration number and donation total at the start of the Fiesta), one player with BERSERKER RISK will get another Berserker. If there are more Berserkers to hand out than players with BERSERKER RISK players will end up with multiple Berserkers. Once the Fiesta has started, BERSERKER RISK is no longer an option. BERSERKER RISK may be added to any run except for a Classic Run. You must have one Monk and one Berserker. The either two characters may be either Monk or Berserker. You must have one Monk, one Berserker and one Beastmaster. The last character can be Monk, Berserker or Beastmaster. For the rest of the game you must always have one Monk, one Berserker, one Beastmaster, and one Dancer in your party. A character need not remain one class exclusively. For example, if Bartz is the Berserker and Krile the Beastmaster, you can swap Bartz to the Beastmaster and Krile to the Berserker at any time. Unlocked sub-skills can be used with any other job. You must have one Monk, one Berserker and one Knight. The last character can be Monk, Berserker or Knight. For the rest of the game you must always have one Monk, two Berserkers and one Knight in your party. Yes, two Bersekers at all times. Just like in Normal Mode, a character need not remain one class exclusively and can use sub-skills they have unlocked from one of the other jobs. - How do I register for a new run? Once your #victory has been processed you may send a new #reg tweet of your choosing. - My save game is corrupted! What do I do? Contact revenantkioku with information about what happened. - I accidentally signed up for the wrong run! If you have made no progress, you should be able to reregister by sending the correct tweet. If nothing happens, please contact revenantkioku with information about what happened.